I’ve pretty much forgotten all about Eyjafjallajoekull (thank God for cut and paste there), and Ju-boy’s story of being stranded in England has also been demoted to the family apocrypha (he only tells it about once a day now). This morning, however, I couldn’t help but be amazed at a time-lapse video posted on my friend Avital’s blog, This and That. Avital is a talented amateur photographer. She blogs about her various hobbies and I have to admit I certainly envy her needlework. This morning, with coffee cup in hand, I watched this video several times. Such a pretty little volcano, does it even realize the havoc it caused a few weeks ago? I’ve actually been to Iceland, it’s aptly named. We were there in the summer of 1970 and there are pictures of my brother and me running around in shorts and heavy sweaters. Watching this video brought back memories of freezing in the summer, so I was grateful for the cup of coffee in hand. I used to be a major coffee snob, buying the best beans, grinding them myself, looking down my nose at people who drank instant coffee. But my taste in coffee has deteriorated over the years. I still buy good coffee, but now it’s of the instant variety. How the snobby have fallen! Back in 2003 I was on a no-carb diet. It worked wonderfully, but makes you very cranky. Coffee helped me get through the day. 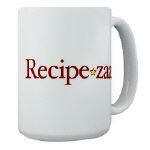 Back then I posted this recipe on Recipezaar, but that mug of coffee has evolved to what I drink today. Add sugar to taste (I like my coffee without sugar). When I married Ju-boy I acquired several things the minute his foot crushed that glass under the chuppah. I acquired 4 step-children, one step-dog, a fantastic turbo oven, a blue kitchen… and his friends. His huge group of friends. Sometimes I refer to them as my friends-in-law. Sometimes I refer to them, usually in the middle of an argument, as “your friends,” and sometimes he accuses me of being friendlier with them than he is. They’re a rowdy, loyal, supportive bunch, and they like my cooking, so I LOVE them! One friend in particular, Yummy Mummy (let’s call her YM for short), is a successful business woman who must have been Peter Roget in a previous life. She doesn’t get drunk, she gets sloshed, she gets tipsy, she gets inebriated, she becomes three sheets to the wind. I mean, why use a long word when you can use a dimunitive one? Face it, a few sips and she’s tanked. But I have the highest respect for YM, even in her potted state, for she is feeling no pain on what she has dubbed Mirjam Juice. 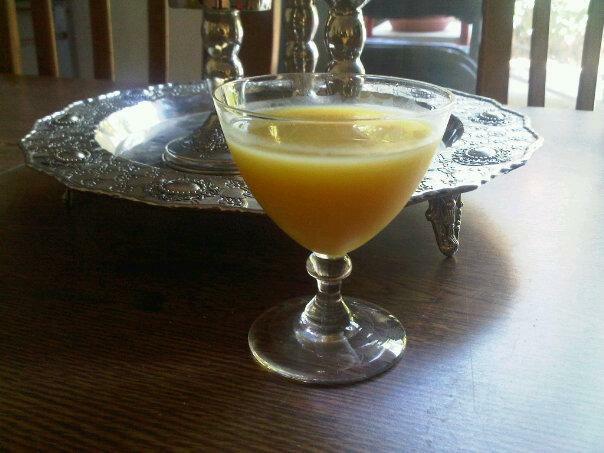 I’d like to introduce you to a concoction of mine — Lemon Cream Liqueur. A total girly drink, but I can count a few manly single malt drinkers amongst its fans. If you want to try some of this, you’re welcome to come over for a sip, just call first so I can inform YM and she can come and we’ll have a party. You’ll need some lemons, a bottle of really cheap vodka or plain grain alcohol (drinking, not medicinal), a little patience, and a Microplane zester. It’s one of my most handy kitchen tools. When I say I married Ju-boy for his oven, well, he married me for my zester. One other thing you’ll need is patience. You need at least a week for the lemon zest to steep in the alcohol, unless, if you’re like me, you forget you left it steeping in a pitcher on top of the fridge and only discover it three months later. It’s still good, if not better. But a week will do for those with less patience or a better memory. This recipe was originally posted on Recipezaar. I use soy milk in my recipe to make this non-dairy (and parve), but you can also use milk, or milk and cream, for a blissful dairy experience. 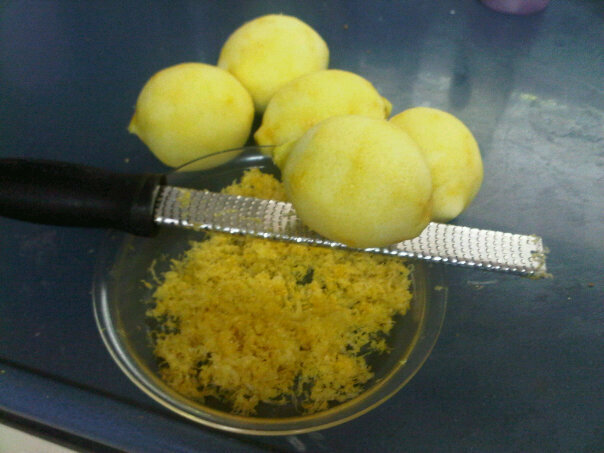 Zest the lemons into a jug (this is where you praise the inventor of the Microplane). 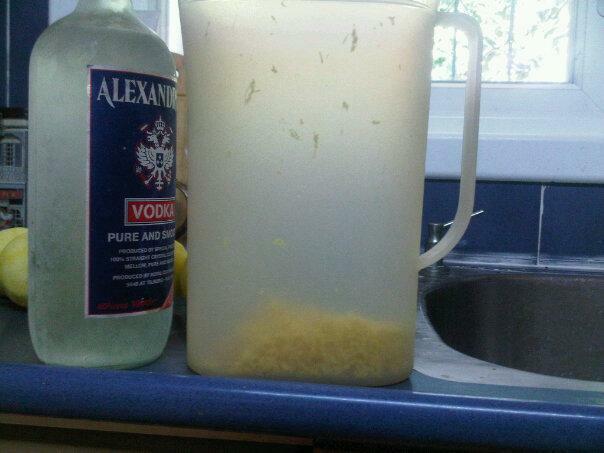 Pour the alcohol/vodka into the jug. You can then juice the lemons, but the lemon juice is not part of this recipe. Do whatever you want with the juice. I usually freeze the juice in ice cube trays or let Shy-boy make lemonade. Cover the jug and hide it somewhere for at least a week. Remember where you hid it. After a week (or month, or entire winter), drain the alcohol. Bring the soymilk and sugar to a boil and let bubble away for about 20 minutes. You need to babysit this, because the minute you turn your back on it, it will bubble over! Mix the lemony alcohol together with the sugary soymilk and let cool. Bottle this stuff up. I save strong plastic water bottles (1 1/2 liter size) just for this purpose. I store this in my freezer. Because of the alcohol it won’t freeze, but become thick, slushy and creamy. The perfect tipple for a hot evening. If you plan on making several batches of this at once, I have a story for you. I once decided to make a quintuple batch to give out as gifts. I was in the supermarket shopping for the ingredients and pulled up to the checkout line just behind the town gossip. I was going through my divorce at the time, and she took one look at my shopping cart with its 30 lemons, 10 kilos of sugar, and 5 liters of vodka and said in one of those bitchy, condescending voices, “How are you coping, dear?” No, she didn’t get some as a gift.